This Disability History Month, Silvie Fisch, director of Northern Cultural Projects and associate researcher with the Oral History Unit & Collective, shares some of the stories she heard during our Foodbank Histories project and reflects on the interconnections between disability, ill health and poverty in the age of Universal Credit. A new report on Universal Credit (UC) in Gateshead and Newcastle published by Teesside and Newcastle Universities and Gateshead City Council concludes that it is not fit for purpose for physically disabled people, people with mental health problems and illnesses, and people with chronic health conditions. It is not the first time the current benefit system and its effects on the most vulnerable in our society has been scrutinised by academic studies. Earlier findings included that the Work Capability Assessment experience caused a deterioration in people’s mental health which individuals did not recover from. The usual response by the Department for Work and Pensions to these qualitative research studies is to dismiss them as not statistically significant. But once the findings add up, they are less easy to dismiss, each one reinforcing a growing body of research evidence. At the same time as the Gateshead study was published, the United Nations Special Rapporteur on extreme poverty and human rights, Philip Alston, produced his interim report of the impact of austerity in the UK, based on evidence he had collected during his two-week tour of the country’s poorest areas. The report states that the costs of austerity have fallen disproportionately upon the poor, women, racial and ethnic minorities, children, single parents, and people with disabilities. The majority of Newcastle West End Foodbank clients (and many volunteers) we interviewed as part of our Foodbank Histories project mentioned long-term physical, often complex health problems. For many it’s even a struggle to get to the foodbank, often due to mobility or financial problems. They told us about their struggles with a punitive and difficult to navigate welfare system that, instead of making their lives easier, leaves them to deal with payment delays and sanctions that lead to debt, hunger and sometimes homelessness. People revealed how they were wrongly declared ‘fit for work’, had their payments cut or removed and waited unacceptably long times for an appeal. Capability tests, poor-quality assessments, long waiting times, incorrect decisions (and the list goes on) – all factors that fuel mental health conditions such as anxiety and depression. While the physical health conditions people mentioned were pre-existing, most interviewees saw a connection between their mental health problems and the problems they encountered within the welfare system. Sometimes, mental and physical health are interconnected. Commonly, men talked to us about their struggles with depression and loneliness. In everyday life, nobody ever cared to ask how they felt or coped. Almost all of them mention life changing experiences, such as bereavements. “I was pretty successful once. And now I’m not. [starts crying] Anyways, I met my girlfriend when I was 19… and she just died a couple of year ago. And this is how I’m in this predicament where I am in this foodbank. And I was with her for 20 years and I’ve got two children to her. She died of severe lung infection. I walked in holding her hand into the hospital, she says I don’t feel well, and then they put her into a coma and she didn’t come out. She’d only just turned 36. “And I did actually propose on her birthday, well I didn’t know she was bad… it was weird. Well anyway, after that, I lost me job, cause I had to look after the kids. And now they put me on this bloody Universal Credit, I still haven’t been paid for 12 weeks, that’s a long time and this is why I’m here. “I couldn’t go back to welding, cause I was drinking a bit too much then, I couldn’t hold a welding torch. And I’ve been to the doctor’s and stuff. I’ve started to calm it down a bit, yeah. I’m still drinking. My mum calls us a functioning alcoholic. It’s just a sad story, isn’t it. It’s the truth. “This place has really helped us. I like it. At least I’m getting hot meals, you know what I mean. I’ve lost three stone since my girlfriend died. Cause I didn’t eat, I was feeding the kids you know, like I say, I was a big drunk, you know what I mean. It was horrible. Then my friend introduced us to this place, he says, Lee you need to start eating. “The Universal Credit has fucked my life up even more. Waiting to get paid, as I said I only had one emergency payment in twelve weeks, and that was at the beginning. And this is why I have to keep coming here, because I can’t afford any food. 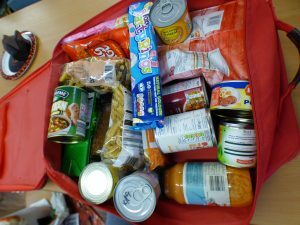 The food parcels are ok. It’s less than what we got last year, but I understand that, because there’s a high demand. “I could imagine the whole of the world going through the same problem I am, but there’s no one there to help you. I went to the doctors, and they don’t help. As I said my friend told us to come here, that’s the next best thing I suppose [laughs]. At least you get to talk to people and stuff, you know what I mean, who aren’t my family. “They are a huge family, but I don’t know… I don’t know, they don’t seem to help. Erm, lots of love and stuff, you know what I mean. But they’ve got their own families, I understand it. Keith shared his story of intergenerational poverty. 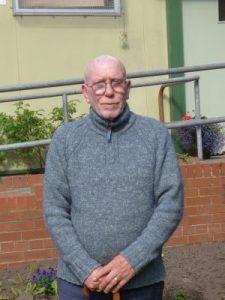 He is helping the Newcastle West End Foodbank establish a garden. Most of the stories we heard showed a correlation between ill health and disability — physical and mental — and poverty. This experience of poverty, lack of opportunity and equality is not something that has just hit people for the first time in their lives. The North East of England has been disproportionally badly affected by privatisation and austerity measures for decades. Intergenerational poverty rules. At the West End Foodbank, the largest in the country, it is common to see three generations sharing a meal, with elderly clients talking about their own parent’s poverty. We also heard a lot about people’s hopes, dreams and ambitions. How they wanted to become police (wo)men, teachers, hairdressers, nannies. Most of them got crushed before they reached adulthood. Generations of people were deprived of a decent life. And no matter how hard they try, they now find it impossible to take control of their situation. Silvie Fisch is the founder and director of Northern Cultural Projects and associate researcher with the Oral History Unit & Collective. She has many years’ experience in disability arts – NCP began life as Disability Cultural Projects. Silvie passionately believes in the power of culture to enhance the quality of life of vulnerable and disadvantaged people and communities. This entry was posted in Oral History Collective, Public History, Reflection, Research, Uncategorised and tagged disability, health, oral history, Oral History Exhibition, partnership working, poverty, universal credit by Alison. Bookmark the permalink.